And coming to my today's recipe.... 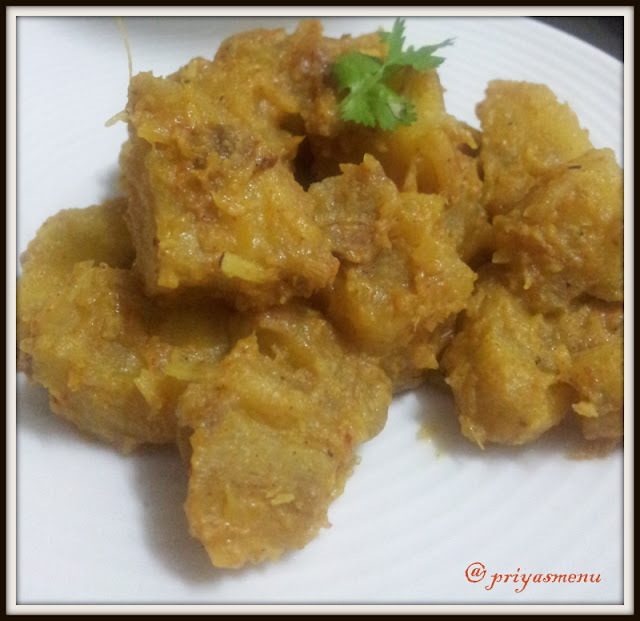 This is my favourite style of preparing plantain masala which I learnt from one of my aunty.. 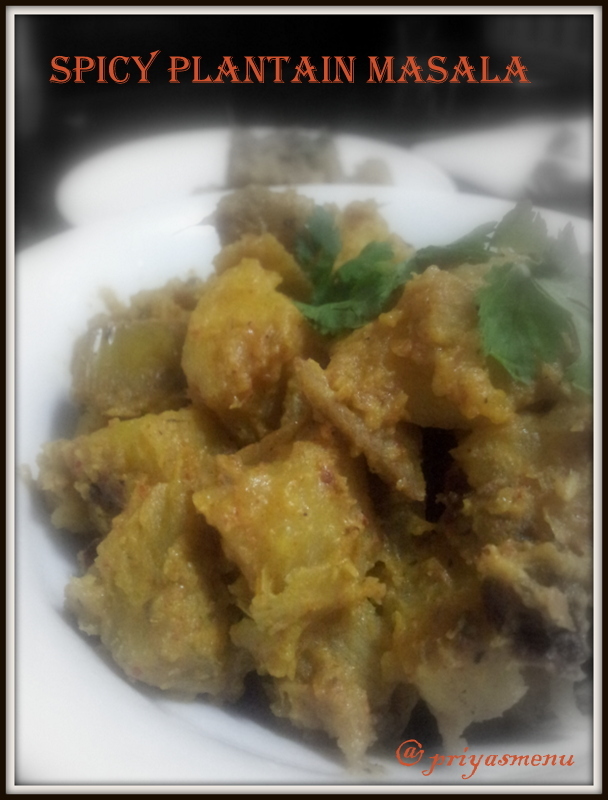 Whenever I prepare this, the aroma n flavors from the masala makes me very nostalgic. Very spicy masala with the delicious flavor of ground fennel seeds.. This can be served with any rice varieties but personally I love this with Curd rice.. The same masala can be roasted in a tawa after it gets cooked to prepare a spicy plantain roast... Check the variation below.. Grind the chopped onion, grated coconut and saunf to a fine paste. Keep aside. Heat oil in a pan and add the cubed plantains. Now add the ground masala and mix well. Simmer it for 10 minutes or until the plantains gets cooked. At this stage add oil, if necessary and mix well. Garnish with the coriander leaves and remove from the flame. Serve with sambhar rice, curd rice or any rice varieties. To make plantain dry roast, just remove from the pan after it gets cooked and roast in a tawa by smearing little oil. 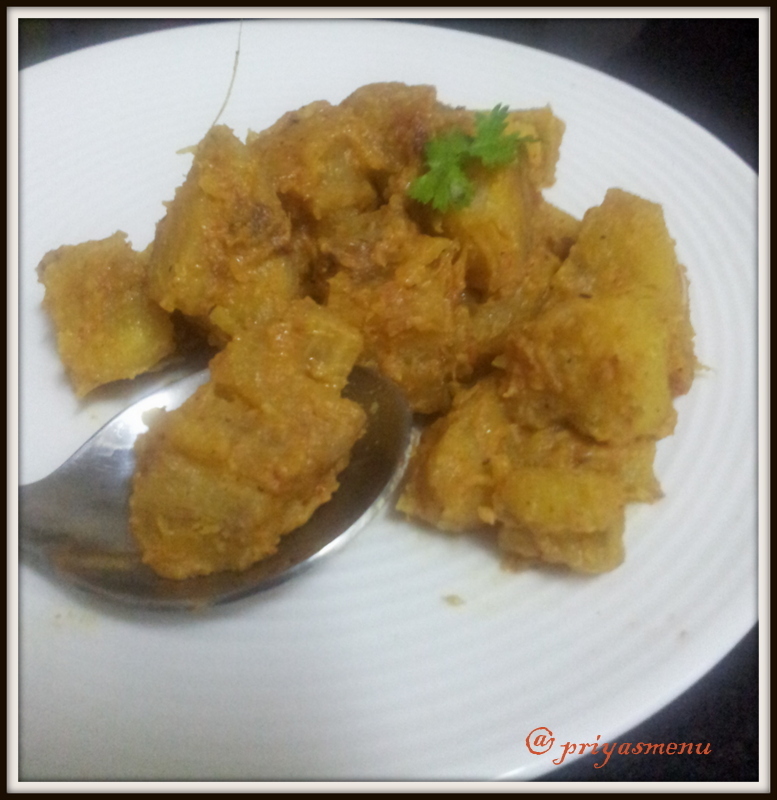 Linking this with Spicy chilly's " My Spicy Recipe "
Haven't tried so far this way Priya..Nice way to bring something exotic from vazhakai..
yummy masala,Haven't tried plantain this way..Thanx for sharing!! Love to see your recipe linked up in Flavors Of Cuisines-"Mexican"
perfect with rasam rice dear.. I do make vazhakkai poriyal and vathakkal. This is an interesting recipe! Love the addition of coconut and saunf making it a moist and perfect spicy accompaniment!